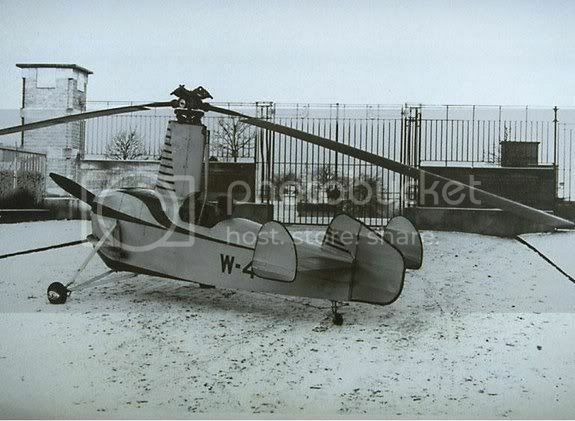 The Hidden Glasgow Forums • View topic - G & J Weir Autogiro's, Cathcart Works. First pic is from the flight trials in England, the other three are from the Cathcart Factory. Weir W-2 experimental autogiro conducting a demonstration flight in 1934 Lord Weir and his brother JG Weir were involved in setting up the Cierva Autogiro Company in 1926 with JG Weir as Chairman. Early versions were built under licence by A.V.Roe and in 1932 G&J Weir obtained the rights to develop autogiros using Cierva patents at their factory in Glasgow. By 1939 Weirs had virtually taken over the Cierva company. 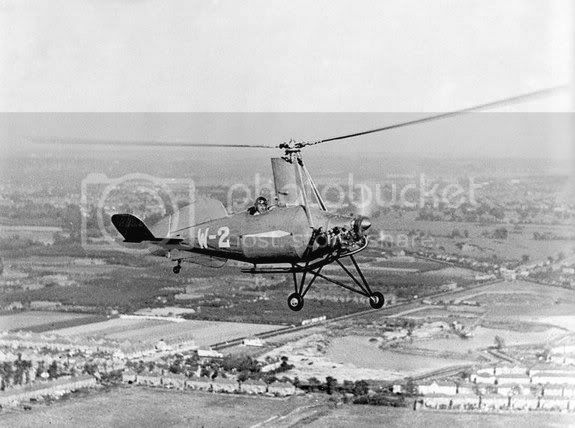 The Weir W-2 autogiro in flight during demonstrations at the Cierva Autogiro Company at Hanworth in 1934. Powered by a flat twin, two cylinder, horizontally-opposed, air-cooled engine also designed and built by G&J Weir. It incorporated an auxiliary drive shaft to spin up the rotor to reduce the take-off run required. G&J Weir designed and built four experimental autogiros numbered W1 to W4 at their Cathcart factory from 1933 to 1937 after which they moved on to produce twin rotor helicopters the W5 and W6 before the work was brought to a halt by the needs of WW2 in 1940. Weir W 4 twin rotor autogyro 1937 A more elegantly finished version of the earlier W 3 design. Weir W 4 design included a Cierva auto dynamic jump-off feature where the rotor was engaged through a direct drive shaft to start lifting. The drive then switched to the tractor airscrew to move forward having already lifted off.he twin rotor Weir W 4 single seat autogyro was powered by a Weir Pixie engine uprated from the W 3 model. The design was the last autogyro made by Weir who by 1938 turned attention to helicopter design.G & J Weir began their involvement in rotorcraft in 1928 when supporting Cierva in the start of the Cierva autogyro company. 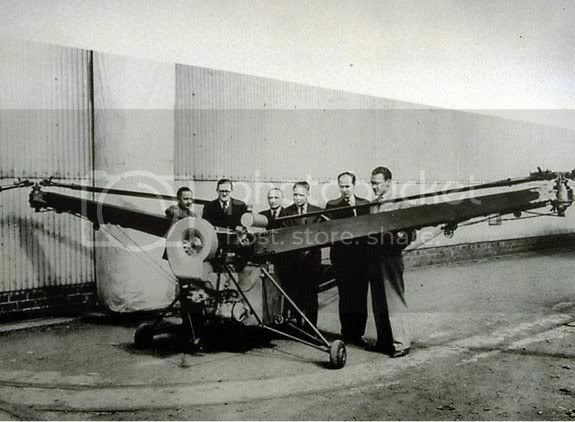 Weir started manufacture of autogyros in 1933 developing 4 successively more refined designs. The W 5 was made up of many earlier autogyro components into a bizarre machine. A single seat uncovered fuselage and outrigger made of plywood box girder construction on each side amid ships on which was mounted a 2 bladed rotor. A modified Weir engine is seen, with a blower cooling fan in front, mounted in the reverse to suit the drive splitting gearing to the rotor arms. The design team are standing behind. It first flew at Dalrymple in June 1938. Weir abandoned autogyro developments in 1937 in favour of the helicopter which they considered had greater potential for passenger use. This was triggered by the success of the W 3 and W 4 autogyro jump off experiments. Weir became interested in helicopter design and pioneered in 1938 the fundamental safety feature of auto-rotation where the rotor is de-clutched from the drive motor allowing safe descent if an engine failed. Demonstrated by their first design the W 5. 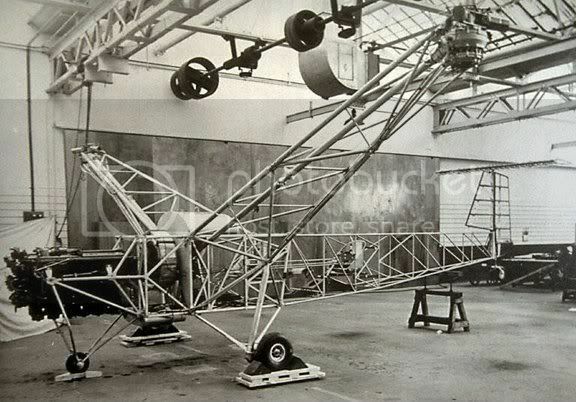 The W 6 was constructed using a tubular framework with 3 bladed rotors on the 2 elevated outrigger arms. A DH Gipsy 6 engine with special cooling fan powered the rotors through a drive splitter gearbox. An early passenger was Air Vice Marshal Teddar 1940. G & J Weir began their involvement in rotorcraft in 1928 when supporting Cierva in the start of the Cierva autogyro company. Weir started manufacture of autogyros in 1933 developing 4 successively more refined designs. Is there one of them in the Transport Museum? It would have been cutting edge technology at the time when Bi-planes were the norm. In the 1935 Hitchcock classic The 39 Steps you can see one of them flying over the highland moors in the hunt for Robert Donat. Not a lot of folk know that. I always though an autogiro was a monday book, when you they'd given up on you and didn't have to sign on any more. ..and Madeleine Carroll slips out of her handcuffs and hangs her stockings in front of the fire..
Re: G & J Weir Autogiro's, Cathcart Works. "The 39 Steps" was on last night and we sat, watched and enjoyed it. The acting was a bit on the rough side but the story's good and it's great to see some of the old scenery. The story was about secret agents trying to steal plans of a new type of silent aeroplane engine. Is it a coincidence that the "helicopter" used in the film was going through its experimental stages? The clip of the Weir - what type was it? Why was it not shown hovering over its prey? Going by the list, it should have been the W3 but with the shaky, super-imposed look it could have been the W4, which was still to be tested successfully. Was the first successful flight at Dalrymple in Ayrshire? Is there a link to pictures of W3 and possibly a stiil/clip from the film of it flying? The autogyro in last night's "The 39 Steps" was a Cierva C-30 built by AV Roe, them that made the Lancaster bomber. For some reason the footage was shown in reverse so that the plane's registration prefic, G for UK reg, ended up as a suffix. And didn't John Laurie look like a member of Dad's Army even then? Excellent. I didn't know we had an autogiro thread. I don't know a great deal about them, but I reckon they're the funkiest flying machines of all. I saw the one from the Bond movie being put through its paces at Yeovilton Air Day one year. I think it was called "Little Nellie". There's another movie that features an autogiro: Max Max II (The Road Warrior). I love the eccentric autogiro pilot who has a snake guarding his machine. Thanks for putting me right folks. I now know that James Buchan placed the story in the south west of Scotland and with the Weirs having an airstrip at Dalrymple, Ayrshire, I saw a connection. Jumping to conclusions: I knew the Weir W3 was around 1935 and when I came onto the site I found "Weir W-2 experimental autogiro conducting a demonstration flight in 1934" on page 1, I thought that, or one of the follow-ups, must have been used in the 1935 classic. Are there any clips or photos of this on the net? And, yes, I heard the Bond music in the background as well. Thanks RM, this is a great site. Hitchock may have had his idea about the autogyro chase because the Met Police were testing them for operational use in 1934 or so. As there weren't many joyriders, or cars, to chase I don't think it met with much success. On a more serious issue, did you see yesterday's incident? Just saw it tonight. There wasn't very much information though.